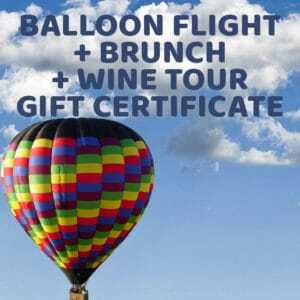 Napa Valley Wine Tours + Hot Air Balloon Ride, Too! If you want something out of the usual during Napa Valley wine tours, there are plenty of options out there to make your winery visits more fun and memorable. It is possible to enjoy wine tours and other activities even on the same day. Balloons Above the Valley (BATV) makes it all possible with their hot air balloon and wine tours packages. Riding in a hot air balloon, you get to enjoy uninterrupted views of the gorgeous and picturesque Napa Valley scenery — neat rows of grapevines that seem to form giant quilts, the lush and green mountains, and hills that surround Napa’s famed valleys. Feel the cool air in the sky and the warmth of the day’s first sunshine as you float along gently with the breeze. You feel you’re almost too close to the heavens and luxuriate yourself in the peace and tranquility which you cherish every moment. This unique experience makes hot air ballooning in Napa the perfect escape from all the hubbub happening on the ground. It is also an ideal way to release all of your stress, bad vibes, or low spirits that you’ve racked up from your everyday routine — when you go up, up in the air, you may not be aware of it but your spirits go up high as well! A hot air balloon could be therapy, too! Special requests that you’d like to take on your journey may include in-flight photos and a champagne flute if you’d like to raise a toast while flying. Of course, you wouldn’t forget to take pictures and videos as your own personal souvenirs of your hot air balloon adventure in Napa. Wine tours are pretty much a standard part of your holiday in Napa. Whenever you go there, a visit to at least one or a couple of wineries is almost inevitable. There, you get to visit different wineries that range from the mainstream to the under-the-radar boutique wineries. Learn the production of wines in stages from grapes to glass, and discover the differences in tastes, bouquets, etc., in Napa’s famous local red and white wines. This package starts with a sunrise hot air balloon ride over the breathtaking Napa Valley. You and the other balloon guests gather inside a hotel lobby where you can chat over freshly prepared breakfast. Then, you’re off to your hot air balloon adventure! After the one-hour flight, you and the other guests will be led to a champagne brunch. It is the perfect opportunity to chat about how fantastic the airborne journey was. After the hot air balloon adventure, Napa Valley Wine Country Tours will go out of its way to take you and the other guests to four to six Napa wineries. These visits include wine tasting (of course) as well as a picnic lunch at one of the wineries. Go around the vineyards in luxury, aboard one of Napa Valley Wine Country Tours’ fleet of limos and limo buses. This package also allows you to choose to do the winery tours right after the hot air balloon adventure on the same day, OR on another day from the balloon ride while you are visiting Napa. *This rate is available for a party of two guests. BATV also offers this package to singles, but the rates can vary. If you plan to visit San Francisco, why not also include a trip to the outskirts? The fact that Napa is less than a two-hour drive away from the city makes it all the more irresistible! When you decide to include a trip to the Wine Country and go on a hot air balloon journey there, BATV’s San Francisco Balloon & Wine Tour Package would be the perfect way to spend it. This package covers two days of wine tours, excellent Napa cuisine, endless sightseeing and comfortable and luxurious transportation. On the first day, you and the other guests will be picked up in San Francisco by Napa Valley Wine Tours, who will then take you to the Wine Country. Visit two wineries in Napa and another two in Sonoma, have a wine and olive oil tasting, and a buffet-style picnic lunch. The second day is the hot air balloon adventure — also complete with a pre-flight breakfast and post-flight brunch with a sparkling wine. After that, you have the option to do shopping and sightseeing at either the Oxbow Public Market or Napa Premium Outlets before going back to San Francisco via a ferry (with free tickets). If you choose to linger, Napa Valley Country Wine Tours will pick you up in early afternoon following the brunch and will drop you off at either the two abovementioned locations. After that, you will then be transported to the Ferry Terminal in Vallejo, where you take the ferry boat back to San Francisco. If you otherwise wish to leave Napa after enjoying your brunch, Napa Valley Country Wine Tours will directly take you to the Ferry Terminal. Wine tours alone can make for great and enlightening experiences especially if you’re a wine lover. There are over 400 wineries in the region and the differences not only lie on their own wines, but also on other factors such as ambiance, architecture, other amenities and staff hospitality that will appeal to the guests. But Napa Valley wine tours can also be enjoyed alongside other activities, such as Balloons Above the Valley’s hot air balloon adventures, which will make your holiday in Napa richer and more rewarding.